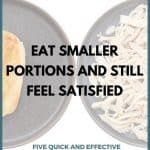 This free guide has five proven portion control strategies to help you feel full and satisfied with less food. After a healthy portion of pasta, your stomach wants more but your brain tries to say no... until now. Subscribe below and I'll send you the guide free! There is no catch. Enjoy!